We extend a warm friendly welcome, with a 5 star service and satisfaction in comfort and detail to all business people, holiday makers, wedding parties, Bowls, Golf, Tennis, Basketball folk, shop-a-holic’s and Eat-a holics. We have it all, within walking distance. Through our back gate to a wonderful small beach on the river esplanade, which has a jetty (see picture). You can swim or fish or just sit on the bench, read, take in the beautiful views, pelicans, herons, cormorants, sandpipers and our own osprey eagles. We have a list of bird routes and sightings in the Maroochy Shire. Through our back gate to Post Office, Chemist, Doctor, Hairdresser, Newsagency, Information Centre and a very large Woolworths. Home to the coast’s biggest shopping venue: Sunshine Plaza. Accommodation is available for one to five guests, offering Studio, Honeymoon, Executive, Garden and Family Units, all nicely appointed, clean and comfortable and all are equipped with kitchenettes, reverse cycle air-conditioning, electric jug, toaster, fridge and microwave. All units are situated on the ground floor and they have a hand rail in all bathrooms. Coin operated washing machine and dryer available. Internet access, parking outside unit. Security camera, entertainment area with BBQ. Affordable and favourite for business and overnight travellers. Tours can be arranged, the favourite being Australia Zoo just 30 minutes away. 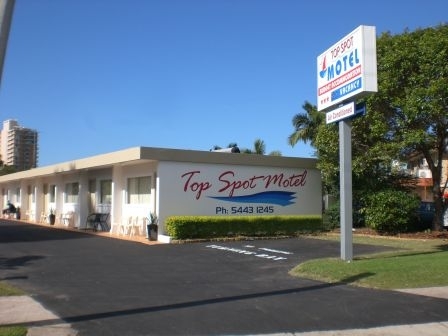 We take pride in managing the Top Spot Motel. Purchased 31.3.08. We have done extensive refurbishing to make it more like a boutique motel. At present, we have a 3½ star AAA Tourism rating but we endeavor to provide a 5 star service.